The standing stock of POM is the amount residing within the stream channel, referred to as coarse benthic organic matter (CBOM) and fine benthic organic matter (FBOM). It reflects the balance between the inputs just described and losses due to breakdown and transport. CBOM is expected to decrease with increasing stream order owing to declines in riparian inputs and lower retention. This is supported by data from first- through fourth-order streams at Coweeta (Wallace et al. 1982b), from Hubbard Brook (Meyer and Likens 1979, Bilby and Likens 1980), and from sites in Michigan and Pennsylvania (Minshall et al. 1983). CBOM typically is greatest in autumn after leaf fall and lowest in late summer, whereas FBOM shows less evidence of seasonal variation (Mulholland et al. 1985b). However, interannual variation appears to be small. In Bear Brook, New Hampshire, midsummer leaf and twig BOM varied only twofold over 4 years of measurements (Meyer and Likens 1979). Clearing of the riparian zone can substantially lower CBOM standing stocks (Karlsson et al. 2005), and catchment urbanization is negatively correlated with the amount of FBOM (Meyer et al. 2005). BOM storage is influenced by the magnitude of terrestrial organic matter inputs and by the retention capacity of the river channel (Jones 1997). BOM is generally dominated by wood followed by coarse and fine materials; however, in some systems FBOM exhibits a greater contribution than CBOM (Newbold et al. 1997, Martinez et al. 1998, Galas and Dumnicka 2003). In first- and second-order streams of the eastern United States, nonwoody BOM ranged between 182 and 855gm—2, in large measure due to differences in storage and retention among stream habitats and bottom substrate (Webster et al. 1995). FBOM was nearly 60% of the total. Over 80% of BOM was estimated to be buried in a Virginia coastal stream (Smock 1990), and for this reason benthic stocks often may be inadequately sampled. High temporal variability was reported for the Njoro River in Kenya, where BOM accumulation ranged from 97.3 to 6691.8 3 g ash-free dry weight m2, probably due to variability in litter inputs and discharge. The retention of BOM is affected by a number of stream features that vary with location and thus potentially determine the efficiency of a stream reach in processing inputs. Retention is likely to be greatest when current velocity is low, when boulders or other channel features create depositional locations and cause accumulation of organic material, when macrophyte beds reduce water velocity, and when floodplain connectivity allows flooding rivers to overflow their banks, slowing the passage of water and material downstream. By increasing the retentiveness of stream reaches, such features should increase the amount of organic matter respired by the consumer community and decrease the amount exported downstream. As retention varies among locations, seasons, or stream types, so should the relationship between processing and export. Depositional areas, especially pools and around wood accumulations, are important locations of FBOM retention. Logs are a particularly important retention device in low-order streams of forested catchments. Accumulations of organic matter formed when wood becomes lodged against obstructions trap smaller material and leaves into a nearly watertight structure. Sediments and organic matter settle in the pools formed upstream of these dams, creating potential hotspots of detrital processing. Following experimental removal of all organic dams from a 175 m stretch of a small New Hampshire stream, organic matter export increased several-fold (Bilby and Likens 1980, Bilby 1981). Log dams become less common as stream size increases. An inventory of organic matter standing stock by Bilby and Likens revealed that 75% was contained in log dams in firstorder streams, compared to 58% at second-order and 20% at third-order sites. However, the history of logging at the site and maturity of the forest will influence the amount and size of available large wood. This New Hampshire location was in second-growth forest and log dams rarely occurred at channel widths greater than 7 m, whereas much larger log dams were found in streams in Oregon flowing through mature stands of Douglas Fir. There also is evidence that wood dams may be more abundant in conifer compared to deciduous forests (Harmon et al. 1986). When beaver (Castor canadensis) were unex-ploited they must have contributed greatly to organic matter storage over large areas of the north temperate zone. Where beaver occur at natural densities today, their activities influence 2-40% of the length of second- to fifth-order streams, and increase the retention time of C roughly sixfold (Naiman et al. 1986). In large rivers, the floodplain can be a primary site of POM deposition and storage, and biotic structures such as macrophyte beds are important retention features for POM (Wanner and Pusch 2001). 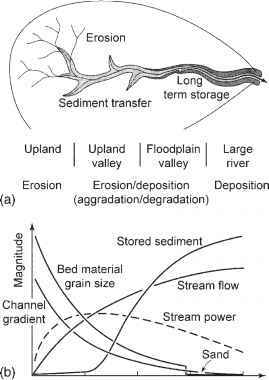 In addition to organic matter accumulations associated with wood dams, stream channel features including pool-riffle succession and the presence of boulders affect retention of POM, and their influence can vary with hydrology. Retention of CPOM was higher in natural meandering sections than in straightened sections of a third-order stream in New Zealand (James and Henderson 2005). Hoover et al. (2006) documented a number of effects of streambed geometry on leaf retention depending on flow and channel features. Protruding boulders were important in retaining leaves in riffles, but not in pools, where leaves simply settled to the bottom. Leaf retention was greater in locations of greater depth and lower water velocity relative to reference streambed measurements across the river channel. The relative importance of pool versus riffle retention changed seasonally in the Njoro River, Kenya, where more CPOM was retained in pools than riffles during high flows, but the retentiveness of these channel features was similar at low flows (Magana and Bretschko 2003). Nakajima et al. (2006) also noted that CPOM accumulated in pools during periods of high flow, probably due to lower velocities near the streambed in pools.